Ever since Eddie Smith purchased the company in 1968, the Grady White shipyard has firmly been evolving and expanding. Before you know it, they have come to be one of the most acknowledged companies producing fiberglass boats. Their success lies in the golden thread between their customers and them. 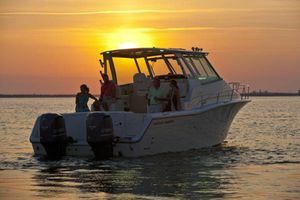 Consequently, by carefully listening to the demands of their clients, their excellence has been so enhanced that Grady White was ranked: "Highest in Customer Satisfaction with Coastal Fishing Boats (17-30 feet), seven times in a row". Side by side with the topmost safety, superiority, practicality and customer satisfaction, their exclusive Sea V2® hull has been graded as number one. This continuously variable vee hull offers a smooth and balanced ride. This hull is sui generis since it steadily sharpens from the transom to the bow which means that the deadrise is nowhere the same on the keel. It’s the most radical hull on the market with the deepest vee forward giving an unprecedented smooth ride. With this miraculous Sea V2® hull, the 370 Express is a peerless craft for offshore saltwater sports fishing. 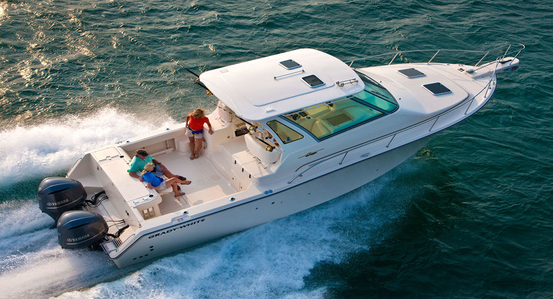 Nevertheless, the boat possesses a myriad of other amenities and functionalities. What is more, she enjoys more features than many larger boats. Let’s analyze the Grady White 370 Express review and discover her bells and whistles. The overall length of the Grady White 370 Express is 39 feet. Her performance is obviously amazing mostly due to the fantastic Sea V2® hull. 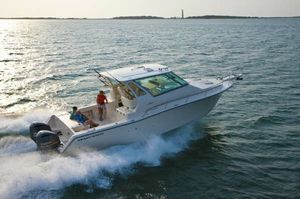 When powered with twin 350 Yamaha four-stroke engines, the optimum cruising speed is approximately around 27 knots with the fuel burn of 36 gallons per hour. The top speed performance is circa 38 knots. 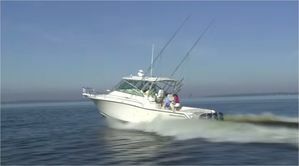 The boat can also be equipped with triple 300 Yamaha four-stroke or triple 350 Yamaha four-stroke engines. Nonetheless, whichever option is chosen, the boat will have incredible force during different weather. The strakes and chines simply smash the spray during the ride and keep the boat dry. 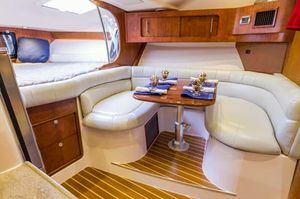 The Grady White 370 Express' layout is fascinating as well and here’s why. The depth of the cockpit of the Grady White 370 Express gives the feeling of a house atmosphere and space. The comfortable folding bench seat occupies the transom. Several stainless steel cup holders are at the fingertips while sitting here. Just behind the settee is the 48-gallon livewell. A sink and a fish box are located to starboard, just behind the passenger seating. The cockpit also has a freshwater shower with both cold and hot water, cockpit blue LED lights, engine flush system, swim platform and a ladder, water tank and so forth. The helm comprises one seating to port and one to starboard. The central skipper’s chair is Deluxe Platinum that can be both vertically and horizontally adjusted and it has a flip-up bolster as well. Just in front of the chair is a stainless steel steering wheel. The dashboard is really flamboyant with the white color and sundry gauges and switches. The galley is to port and it greets the passengers below deck. 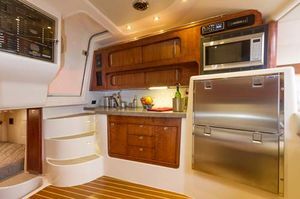 The galley encompasses a Corian countertop and cutting board, sink, rail light, refrigerator, ice box and a microwave. Opposite the galley, to starboard, is a U-shaped settee with the adjustable cherry dinette table that can be converted into a sleeping berth. 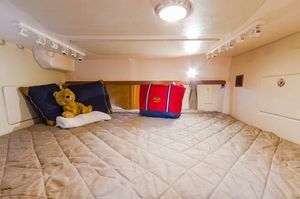 The forward berth has sleeping space for two. The Head possesses all of the relevant elements like a sink, Corian countertop, a shower, mirror, cherry shelves, VacuFlush ® marine holding tank and some storage. 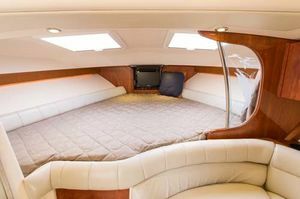 Aft is a double berth mattress. The entertainment aspect of the boat is highlighted with the 19-inch flat screen LED-LCD TV with DVD player and audio/visual inputs and a Stereo System with AM/FM tuner, MP3, Bluetooth, remote control and speakers; two speakers in the cockpit, two in the cabin and two in the helm. 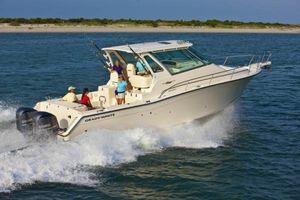 The brand new Grady White 370 Express is an entertaining, day boating, cruising and fishing machine that blows one’s mind with all the features and assets. Besides the fishing functions, she is also an elegant family-and-friends cruiser. She has sleeping space for five, entertaining space for 15+ and fishing amenities. The aforementioned walkthrough has certainly convinced you to contact us now! Contact us now and we will contact you back ASAP. Don’t let this opportunity slip away. Get onboard the Express 370 today!